Age-related macular degeneration (AMD) is the leading cause of blindness for adults over the age of 60. It is an irreversible condition, which can ultimately rob someone of their sight. Nearly 11 million Americans have some form of age-related macular degeneration and this number is expected to double by the year 2020. As the name would indicate, age is the primary risk factor and the risk of developing age-related macular degeneration increases with age. For those aged 50 to 59, the risk of AMD increases two percent each year but jumps 30 percent for those over the age of 75. There are different types of age-related macular degeneration such as wet and dry, which is outlined below. Furthermore, aside from age, other risk factors include stress and diet. Below you will uncover all the information you need to know about AMD and how you can protect yourself as you age. 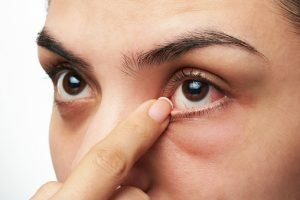 Dry macular degeneration is a common eye disorder that requires early treatment if you want to avoid vision loss, but macular problems can also be classified as wet. So, here we take a look at dry vs. wet AMD (age-related macular degeneration). Dry macular degeneration treatment can be complicated. The condition is a common eye disorder that generally affects people over the age of 65. The macula is the part of the eye responsible for clear vision directly in your line of site. Therefore, degeneration or deterioration of the macula can lead to blurry or reduced central vision. Wet macular degeneration is an eye disease that can cause blurred vision or even blind spots in a person’s visual field. While it is not as common as dry macular degeneration, it does account for 90 percent of all cases of severe vision loss resulting from the disease. New research was recently published in the journal Optometry and Vision Science examining the role that psychological stress plays in relation to age-related macular degeneration (AMD). Age-related macular degeneration is a form of progressive vision loss that is the most prevalent cause of vision loss among older Americans. Our ability to see is something we should all cherish. Seeing the beauty of a sunset or the smile of your newly born grandchild can help create memories that last a lifetime. Unfortunately, as with all things in life, our eyes gradually begin to deteriorate, being encumbered by a decreased visual field, floaters, or even complete vision loss. And then there’s macular degeneration, a form of irreversible vision loss in people over the age of 60 that develops with age. It is never a cause of total blindness, but it can be a source of significant visual disability. A new study has found that switching to a low glycemic diet could potentially put a stop to this disease altogether.